My checklist for my City Hall interview included my reporter’s notebook, a pen, a camera, my blazer and coffee. 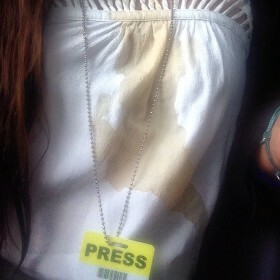 It didn’t include a bib-sized brown stain on my favorite white shirt or the events leading up to it. Shelby Boamah, John Dargan, videographers at The New York Times Student Journalism Institute, and I all had early-morning interviews. One of the institute mentors, Jinx Broussard, was shuttling us to our destinations. John was headed to cover the re-opening of the Riverwalk Marketplace, a New Orleans retail outlet. Shelby and I were headed to City Hall. Shelby was hoping to touch base with a representative from the mayor’s office. I was interviewing the first deputy mayor and the director of enterprise information. I was feeling especially victorious, after having navigated the twists and turns of the municipal communications department to set up an interview well ahead of my deadline. It was a nice change of pace to be out of the newsroom and take in some of the New Orleans scenery, even as seen from the freeway. It’s still an adjustment for this desert native to see green foliage on every surface. At a stoplight less than five minutes from arrival at City Hall, we watched the light turn green and began to creep forward when a Coca-Cola-loaded semi-truck barreled through the intersection from the opposite direction. We scoffed at the drivers’ insensitivity to traffic laws. Immediately after, another car sped through the red light. Then with a comic-book BAM!, a white S.U.V. slammed into Jinx’s rear bumper. I watched a torrent of coffee leap from my lidless cup and onto the dashboard, my blouse, my bag and the floor. It was accompanied by a few four-letter words not fit for print. A quick visual survey showed that everyone, including the other driver, was O.K. Jinx pulled to the side of the road, called her husband, then conferred with the other driver and the New Orleans Police Department. I had 13 minutes until my scheduled interview, and according to Google Maps, it was a 10-minute walk to City Hall. Shelby packed up her camera gear and we headed into the humid morning at a fast pace, leaving John and Jinx behind. I wondered if John made it to his interview. At the same time, Shelby and I arrived sweaty and tired but were welcomed by the cool relief of the air-conditioned building. Despite emptying half of a stain-busting pen on my shirt and buttoning my blazer, there was no escaping the sepia tie-dye pattern on my shirt. I traded my professional appearance for an interview icebreaker. I’m thankful that no one was hurt, that insurance will pay for the car’s repair and that I wore flat shoes for the unexpected hike to City Hall.